The second tree we planted today was a Pinus pinea "Italian Stone Pine" which I had used as my Christmas tree these last holidays. It's one of my favorite trees to use for small live Christmas trees because of it's pretty pale bluish green, wide bushy shape, and short needles. 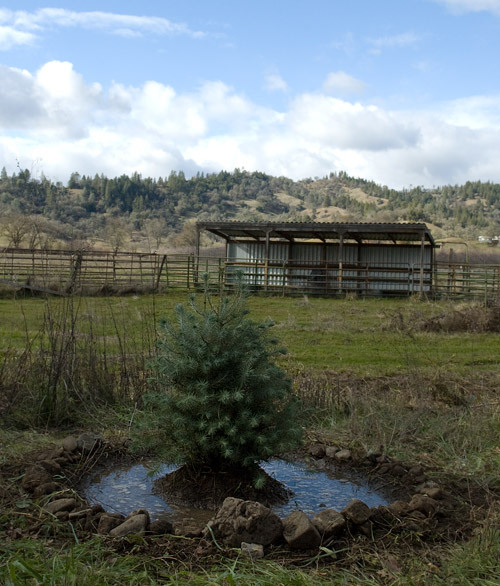 We planted this two gallon tree down the hill from the house, between the greenhouse and the current trailer location, with the irrigation ditch behind it. In the photo you can see the cattle shelter. this one is really really cute, it reminds of on old friend who was a nesting pine we liked to call allison, they would like each other.